"To adjust for opponent strength, I could adjust each team efficiency stat according to the average opponents’ corresponding stat. In other words, I could adjust the Cardinals’ passing efficiency according to their opponents’ average defensive efficiency. I’d have to do that for all the stats in the model, which would be insanely complex. But I have a simpler method that produces the same results. Peyton Manning - Colts Defensive MVP?? 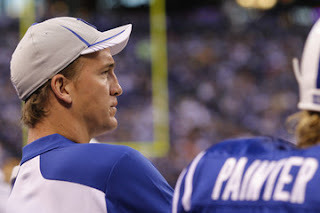 A growing sentiment that has started to crop up with a lot of the talking heads in the league is that the Colts would be pretty terrible if Peyton Manning was playing because the defense has been so atrocious. These same people love to state the obvious and point out that Peyton Manning doesn’t make tackles. However, a lot of stats analysts have known over the years that the Colts offense has actually helped the Colts defense in 3 key ways.